This article is about the class of chemical compounds. For other uses, see Alum (disambiguation). 2O, where A is a monovalent cation such as potassium or ammonium and M is a trivalent metal ion such as aluminium or chromium(III). When the trivalent ion is aluminium, the alum is named after the monovalent ion. Alums are useful for a range of industrial processes. They are soluble in water, have a sweetish taste, react acid to litmus, and crystallize in regular octahedra. In alums each metal ion is surrounded by six water molecules . When heated, they liquefy, and if the heating is continued, the water of crystallization is driven off, the salt froths and swells, and at last an amorphous powder remains. They are astringent and acidic. Historically, alum was used extensively in the wool industry from the Classical Times, during the Middle Ages, and well into 19th century as a mordant or dye fixative in the process of turning wool into dyed bolts of cloth. Some alums occur as minerals. The most important members - potassium, sodium, and ammonium - are produced industrially. Typical recipes involve combining alumina, sulfuric acid, and the sulfate second cation, potassium, sodium, or ammonium. Potassium alum has been used at least since Roman times for purification of drinking water and industrial process water. Between 30 and 40 ppm of alum for household wastewater, often more for industrial wastewater, is added to the water so that the negatively charged colloidal particles clump together into "flocs", which then float to the top of the liquid, settle to the bottom of the liquid, or can be more easily filtered from the liquid, prior to further filtration and disinfection of the water. Alum solution has the property of dissolving steels while not affecting aluminium or base metals, and can be used to recover workpieces made in these metals with broken toolbits. lodged inside them. Alum in block form (usually potassium alum) can be used as a blood coagulant. Styptic pencils containing aluminium sulfate or potassium aluminium sulfate are used as astringents to prevent bleeding from small shaving cuts. Alum powder, found in the spice section of many grocery stores, may be used in pickling recipes as a preservative to maintain fruit and vegetable crispness. Alum is used as the acidic component of some commercial baking powders. Alum was used by bakers in England during the 1800s to make bread whiter. This was thought by some, without adequate scientific grounds, to cause rickets. The Sale of Food and Drugs Act 1875 prevented this and other adulterations. Solutions containing alum may be used to treat cloth, wood, and paper materials to increase their resistance to fire. Alum is also used for fireproofing wood. Alum is used in the tanning of animal hides to remove moisture, prevent rotting, and produce a type of leather. Traditionally treating hides with alum, instead of tannic acid, is called tawing and not tanning. The product is traditionally called parchment instead of leather. Alum is used in the treatment of canker sores in the mouth, as it has a significant drying effect to the area and reduces the irritation felt at the site. Alum is the major adjuvant used to increase the efficacy of vaccines, and has been used since the 1920s. Alum has been used to stop bleeding in cases of hemorrhagic cystitis. Alum is used to fix pigments on a surface, for example in paper marbling. Alum is an ingredient in some recipes for homemade modeling compounds intended for use by children. These are often called "play clay" or "play dough" for their similarity to "Play-Doh". The word 'alumen' occurs in Pliny's Natural History. In the 52nd chapter of his 35th book, he gives a detailed description. By comparing this with the account of 'stupteria' given by Dioscorides in the 123rd chapter of his 5th book, it is obvious the two are identical. Pliny informs us that 'alumen' was found naturally in the earth. He calls it 'salsugoterrae'. Different substances were distinguished by the name of 'alumen', but they were all characterised by a certain degree of astringency, and were all employed in dyeing and medicine, the light-colored alumen being useful in brilliant dyes, the dark-colored only in dyeing black or very dark colors. One species was a liquid, which was apt to be adulterated; but when pure it had the property of blackening when added to pomegranate juice. This property seems to characterize a solution of iron sulfate in water; a solution of ordinary (potassium) alum would possess no such property. Pliny says that there is another kind of alum that the Greeks call 'schiston', and which "splits into filaments of a whitish colour", From the name 'schiston' and the mode of formation, it appears that this species was the salt that forms spontaneously on certain salty minerals, as alum slate and bituminous shale, and consists chiefly of sulfates of iron and aluminium. In some places the iron sulfate may have been lacking, so the salt would be white and would answer, as Pliny says it did, for dyeing bright colors. Pliny describes several other species of alumen but it is not clear as to what these minerals are. 2O. Contamination with iron sulfate was greatly disliked as this darkened and dulled dye colours. They were acquainted with a variety of substances of varying degrees of purity by the names of misy, sory, and chalcanthum. As alum and green vitriol were applied to a variety of substances in common, and as both are distinguished by a sweetish and astringent taste, writers, even after the discovery of alum, do not seem to have discriminated the two salts accurately from each other. In the writings of the alchemists we find the words misy, sory, chalcanthum applied to alum as well as to iron sulfate; and the name atramentum sutorium, which one might expect to belong exclusively to green vitriol, applied indifferently to both. Various minerals are employed in the manufacture of alum, the most important being alunite, alum schist, bauxite and cryolite. In the 18th century, Johann Heinrich Pott (1692–1777) and Andreas Sigismund Marggraf demonstrated that alumina was a constituent. Pott in his Lithogeognosia showed that the precipitate obtained when an alkali is poured into a solution of alum is quite different from lime and chalk, with which it had been confounded by G.E. Stahl. Marggraf showed that alumina is one of the constituents of alum, but that this earth possesses peculiar properties, and is one of the ingredients in common clay. 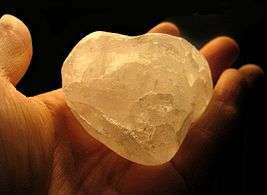 He also showed that crystals of alum can be obtained by dissolving alumina in sulfuric acid and evaporating the solutions, and when a solution of potash or ammonia is dropped into this liquid, it immediately deposits perfect crystals of alum. Torbern Bergman also observed that the addition of potash or ammonia made the solution of alumina in sulfuric acid crystallize, but that the same effect was not produced by the addition of soda or of lime, and that potassium sulfate is frequently found in alum. After M.H. Klaproth had discovered the presence of potassium in leucite and lepidolite, it occurred to L. N. Vauquelin that it was probably an ingredient likewise in many other minerals. Knowing that alum cannot be obtained in crystals without the addition of potash, he began to suspect that this alkali constituted an essential ingredient in the salt, and in 1797 he published a dissertation demonstrating that alum is a double salt, composed of sulfuric acid, alumina, and potash. Soon after, J.A. Chaptal published the analysis of four different kinds of alum, namely, Roman alum, Levant alum, British alum and alum manufactured by himself. This analysis led to the same result as Vauquelin. Egyptians reportedly used the coagulant alum as early as 1500 BC to reduce the visible cloudiness (turbidity) in the water. Alum was imported into England mainly from the Middle East, and, from the late 15th century onwards, the Papal States for hundreds of years. Its use there was as a dye-fixer (mordant) for wool (which was one of England's primary industries, the value of which increased significantly if dyed). These sources were unreliable, however, and there was a push to develop a source in England especially as imports from the Papal States were ceased following the excommunication of Henry VIII. In the 13th and 14th centuries, alum (from alunite) was a major import from Phocaea (Gulf of Smyrna in Byzantium) by Genoans and Venetians (and was a cause of war between Genoa and Venice) and later by Florence. After the fall of Constantinople, alunite (the source of alum) was discovered at Tolfa in the Papal States (1461). The textile dyeing industry in Bruge, and many other locations in Italy, and later in England, required alum to stabilize the dyes onto the fabric (make the dyes "fast") and also to brighten the colors. With state financing, attempts were made throughout the 16th century, but without success until early on in the 17th century. An industry was founded in Yorkshire to process the shale, which contained the key ingredient, aluminium sulfate, and made an important contribution to the Industrial Revolution. One of the oldest historic sites for the production of alum from shale and human urine are the Peak alum works in Ravenscar, North Yorkshire. By the 18th century, the landscape of northeast Yorkshire had been devastated by this process, which involved constructing 100 feet (30 m) stacks of burning shale and fuelling them with firewood continuously for months. The rest of the production process consisted of quarrying, extraction, steeping of shale ash with seaweed in urine, boiling, evaporating, crystallisation, milling and loading into sacks for export. Quarrying ate into the cliffs of the area, the forests were felled for charcoal and the land polluted by sulfuric acid and ash. In order to obtain alum from alunite, it is calcined and then exposed to the action of air for a considerable time. During this exposure it is kept continually moistened with water, so that it ultimately falls to a very fine powder. This powder is then lixiviated with hot water, the liquor decanted, and the alum allowed to crystallize. The alum schists employed in the manufacture of alum are mixtures of iron pyrite, aluminium silicate and various bituminous substances, and are found in upper Bavaria, Bohemia, Belgium, and Scotland. These are either roasted or exposed to the weathering action of the air. In the roasting process, sulfuric acid is formed and acts on the clay to form aluminium sulfate, a similar condition of affairs being produced during weathering. The mass is now systematically extracted with water, and a solution of aluminium sulfate of specific gravity 1.16 is prepared. This solution is allowed to stand for some time (in order that any calcium sulfate and basic ferric sulfate may separate), and is then evaporated until ferrous sulfate crystallizes on cooling; it is then drawn off and evaporated until it attains a specific gravity of 1.40. It is now allowed to stand for some time, decanted from any sediment, and finally mixed with the calculated quantity of potassium sulfate, well agitated, and the alum is thrown down as a finely divided precipitate of alum meal. If much iron should be present in the shale then it is preferable to use potassium chloride in place of potassium sulfate. Many trivalent metals are capable of forming alums. The general form of an alum is AMIII(SO4)2·nH2O, where A is an alkali metal or ammonium, MIII is a trivalent metal, and n often is 12. In general, alums are easier formed when the alkali metal atom is larger. This rule was first stated by Locke in 1902, who found that if a trivalent metal does not form a caesium alum, it neither will form an alum with any other alkali metal or with ammonium. 5), B is a trivalent metal ion, such as aluminium, chromium, titanium, manganese, vanadium, iron(III), cobalt(III), gallium, molybdenum, indium, ruthenium, rhodium, or iridium. Analogous selenates also occur. The specific combinations of univalent cation, trivalent cation, and anion depends on the sizes of the ions. For example, unlike the other alkali metals the smallest one, lithium, does not form alums, and there is only one known sodium alum. In some cases, solid solutions of alums occur. 2O, mainly occurs in nature as the mineral mendozite. It is very soluble in water, and is extremely difficult to purify. In the preparation of this salt, it is preferable to mix the component solutions in the cold, and to evaporate them at a temperature not exceeding 60 °C. 100 parts of water dissolve 110 parts of sodium alum at 0 °C, and 51 parts at 16 °C. Soda alum is used in the acidulent of food as well as in the manufacture of baking powder. 2O, a white crystalline double sulfate of aluminium, is used in water purification, in vegetable glues, in porcelain cements, in deodorants (though potassium alum is more commonly used), in tanning, dyeing and in fireproofing textiles. 4) instead. They are called selenium- or selenate-alums. They are strong oxidizing agents. Aluminium sulfate is referred to as papermaker's alum. Although reference to this compound as alum is quite common in industrial communication, it is not regarded as technically correct. Its properties are quite different from those of the set of alums described above. Most industrial flocculation done with alum is actually aluminium sulfate. ↑ Austin, George T. (1984). Shreve's Chemical process industries. (5th ed.). New York: McGraw-Hill. p. 357. ISBN 9780070571471. 1 2 Samuel D. Faust, Osman M. Aly (1999). Chemistry of water treatment (2nd ed.). Chelsea, MI: Ann Arbor Press. ISBN 9781575040110. ↑ Bratby, John (2006). Coagulation and flocculation in water and wastewater treatment (2nd ed.). London: IWA Publ. ISBN 9781843391067. ↑ Rice, J. K. (June 1957). "The use of organic flocculants and flocculating aids in the treatment of industrial water and industrial waste water". Symposium on Industrial Water and Industrial Waste Water. ASTM International (207): 41–51. ↑ Handa, Parvesh (1982). Herbal beauty care. New Delhi: Orient Paperbacks. p. 12. ISBN 9788122200249. Retrieved 7 January 2016. ↑ Kanlayavattanakul, M.; Lourith, N. (1 August 2011). "Body malodours and their topical treatment agents". International Journal of Cosmetic Science. 33 (4): 298–311. doi:10.1111/j.1468-2494.2011.00649.x. PMID 21401651. ↑ Aguilar, T. N.; Blaug, S.M. ; Zopf, L.C. (July 1956). "A study of the antibacterial activity of some complex aluminum salts". Journal of the American Pharmaceutical Association. American Pharmaceutical Association. 45 (7): 498–500. PMID 13345689. 1 2 3 4 Alumen, and the Several Varieties of it; Thirty-eight Remedies., Pliny the Elder, The Natural History, book 35, chapter 52; on the Perseus Digital Library at Tufts University. Last accessed 27 December 2011. ↑ Church Pastoral-aid Society, London (January–June 1847). "Brown Bread". The Church of England magazine. 22: 355. ↑ Hassall, Arthur Hill (1857). "Adulterations detected; or, Plain instructions for the discovery of frauds in food and medicine". ↑ Mbow, M Lamine; De Gregorio, Ennio; Ulmer, Jeffrey B (2011). "Alum's adjuvant action: grease is the word". Nature Medicine (17): 415–416. doi:10.1038/nm0411-415. ↑ Marrack, Philippa; McKee, Amy S.; Munks, Michael W. (2009). "Towards an understanding of the adjuvant action of aluminium". Nature Reviews Immunology. 9 (4): 287–293. doi:10.1038/nri2510. ISSN 1474-1733. ↑ Kennedy, C; Snell, ME; Witherow, RE (1984). "Use of Alum to Control Intractable Vesical Haemorrhage". British Journal of Urology (56): 673–675. doi:10.1111/j.1464-410X.1984.tb06143.x. ↑ A. Archontidou 2005, "Un atelier de preparation de l'alun a partir de l'alunite dans l'isle de Lesbos" in L'alun de Mediterranée. ed P. Borgard et al. ↑ Marggraf (1754) "Expériences faites sur la terre d'alun" (Experiments made on the earth of alum), Mémoires de l'Académie des sciences et belles-lettres de Berlin, pp. 41-66. ↑ Marggraf (1754) "Expériences qui concernent la régénération de l'alun de sa propre terre, l'après avoir séparé par l'acide vitriolique ; avec quelques compositions artificielles de l'alun par moyen d'autres terres, et dudit acide" (Experiments that concern the regeneration of alum from its own earth, after having separating it by sulfuric acid ; with some artificial compounds of alum by means of other earths and the aforesaid acid), Mémoires de l'Académie des sciences et belles-lettres de Berlin, pp. 31-40. Martin Heinrich Klaproth, Beiträge zur Chemischen Kenntniss Der Mineralkörper [Contributions to [our] chemical knowledge of mineral substances], vol. 2 (Posen, (Germany): Decker and Co., and Berlin, (Germany): Heinrich August Rottmann, 1797). His finding that leucite contains potassium ("potash") appears on pp. 45-46. His finding that lepidolite contains potassium appears on p. 193. English translation: Martin Heinrich Klaproth, Analytical Essays Towards Promoting the Chemical Knowledge of Mineral Substances, volumes 1-2, (London, England: T. Cadell, Jr. & W. Davies, 1801). His finding of potassium in leucite appears on pp. 353-354. 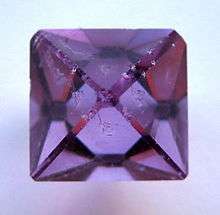 His finding of potassium in lepidolite appears on p. 472. Klaproth expressed great surprise upon finding potassium in leucite because potash had previously been considered to be a constituent of plants only. From pp. 353-354: "On the contrary, I was surprised in an unexpected manner, by discovering in it another constituent part, consisting of a substance, the existence of which, certainly, no one person would have conjectured within the limits of the mineral kingdom … This constituent part of leucite … is no other than pot-ash, which, hitherto, has been thought exclusively to belong to the vegetable kingdom, and has, on this account, been called VEGETABLE ALKALI. — This discovery, which I think of great importance, cannot fail to occasion considerable changes in the systems of natural history, … ." ↑ Vauquelin (1797) "Sur la nature de l'Alun du commerce, sur l'existence de la potasse dans ce sel, et sur diverses combinaisons simples ou triples de l'alumine avec l'acide sulfurique" (On the nature of commercial alum, on the existence of potash in this salt, and on various simple or triple compounds of alumina with sulfuric acid), Annales de Chimie et de Physique, 1st series, 22 : 258-279. ↑ J. A. Chaptal (1797) "Comparée des quatre principales sortes d'Alun connues dans le commerce; et Observations sur leur nature et leur usage" (Comparison of the four main types of commercial alum; and observations on their nature and use), Annales de Chimie et de Physique, 1st series, 22 : 280-296. ↑ J. Locke (1902). "On some double sulphates of thallic thallium and caesium". American Chemical Journal. 27: 281. ↑ Greenwood, N. N.; & Earnshaw, A. (1997). Chemistry of the Elements (2nd Edn. ), Oxford: Butterworth-Heinemann. ISBN 0-7506-3365-4.